Q: How do I choose a Captain? A:: Once you decide what port you want to fish you can choose from a selection of captains. All captains have phone numbers and will let you know about fishing, available dates, and everything you need to make your charter enjoyable. 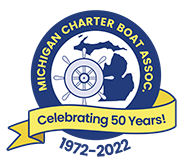 Q: Where do Michigan Charter Boat captains operate? A:: Michigan has over 100 ports and five Great Lakes with various marinas and launch ramps. Charter captains operate from these locations. See:Lake Michigan Fishing Charters | Lake Huron Fishing Charters | Lake Erie Walleye Fishing Charters | Lake St. Clair Fishing Charters | Lake Superior Fishing Charters , or Shipwreck Dives, Sailboat Charters, or Sight Seeing Cruises. The entire coast of Michigan is over 3000 miles long. Q: What requirements do MCBA captains need? A:Michigan fishing Charters captains are required by federal law to have a United States Coast Guard (USCG) license. In addition, and for your safety, the USCG requires all licensed operators to be enrolled in a random drug testing program. USCG also requires all vessels for hire to be documents and routinely inspected. The state of Michigan also requires charters vessels to pass state inspection. Q: Who could enjoy a charter boat? A: Michigan Fishing Charters can be enjoyed by a single person, a family with young children or any type of group. Many charter specialists are also willing to give handicapped clients special consideration. Q: Are charter boats licensed? A: Yes...fishing charter boats of six passengers or less are state inspected. Seven passengers or more are U.S. Coast Guard inspected. All captains listed in the Michigan Charter Boat directory are U.S. Coast Guard licensed operators. Q: When using a fishing charter, do I need a fishing license? A: Yes, Michigan law requires that anyone fishing in Michigan waters be licensed. When you make your fishing charter reservation ask your fishing charter captain if they sell Michigan fishing licenses on board their charter boat. Q: What type of fish can be caught on fishing charter? A: Depending on whether you choose your Michigan Fishing Charter on Lake Michigan, Lake Superior, Lake Huron, Lake Erie , or Lake St. Clair, you can catch chinook salmon, steelhead, (rainbow trout), coho salmon, brown trout, lake trout, pink salmon, and warmer water species like walleye, perch, musky, bass. See Michigan Fish species for types of fish you can catch on your next Michigan Fishing Charter. Q: When I make Michigan charter boat reservations, what type of questions should I ask? Q: What about other Michigan lakes and rivers? A: In some cases, Michigan charters have access to other Michigan lakes and rivers (Au Sable River, Big Manistee , Betsie River, Grand River, Detroit River, Kalamazoo River, Muskegon River, Saginaw River, St. Clair River, St. Joseph River, St. Mary's River). Ask your reservations agent about this. Q: I still have questions, can I call the MCBA office?